Does your little one love dinosaurs? Then the Dino Puzzle set of early learning games will be their new favourite! Young children can practice their problem-solving skills in a bright and colourful landscape filled with fun dino characters. 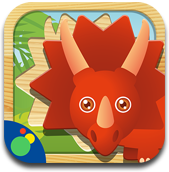 Children can see their new pre-historic friends pop up in a variety of games where they can complete puzzles, learn dinosaur names and shapes and create pictures in jolly dinosaur scenes. Learning has never been so 'roar-some'! 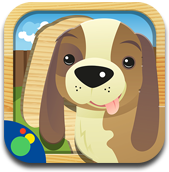 Children will love the little animals in Cute Pets Puzzle. There are cats, dogs, bunnies, birds and more to discover for preschool children of all ages. They’ll have lots of fun in a cute and ‘amewsing’ world of pets. Cute Pets Puzzle will soon help your child become familiar with the shapes of the little pets and be able to put the names to their pictures. They can finish pictures by adding the right animal shapes or choose a puzzle with their favourite pets. What a ‘paw-some’ way to learn and have fun! 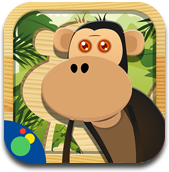 Your little 'monkey' will be soon be wild about Jungle Animal Puzzles! This set of early learning games includes fun and educational games for very young children, all based around some of their favourite jungle animals. Kids can practice their motor skills by using the colourful animals to complete puzzles or hear the right names when they choose an animal flash card. They’ll enjoy learning in a fun world of jungle animals so much, there will be no ‘cheaters’! For all the fun of the farm, ‘ewe’ must try Farm Animal Puzzle! 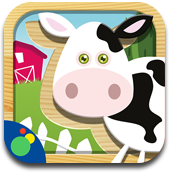 Young children can have fun adding farm animal favourites into pictures or they can ‘moooo-ve’ puzzle pieces to complete a whole animal character! All the activities are set in jolly farm scenes and children will be learning new skills while they are playing games with the farm animal characters - ’shear’ fun! Follow us on Twitter for all the latest offers and news!